We would prefer bookings to be made from Friday to Friday. Our first floor apartment overlooking the sea with a great view of the bay and surrounding countryside. Positioned on the shore edge with uninterrupted views of the coastline and direct access to the sea. Located close to the fishing village of Fornells, ideally suited to holiday for relaxing, swimming, eating, walking and generally soaking up the local atmosphere. Menorca, the least discovered of the Balearic Islands, is the one that has best kept its charm. Free from the crowds and large scale town planning the island has a peaceful lifestyle and many attractions. It has not been spoilt by massive development and is a conservation area for the EEU.There are many totaally undeveloped beaches and coves area from our village is completely undeveloped for about 10 miles. There is a 17 century track round the coast which s well marked which is perfect for walkers and bird watchers and for people who want to find a small cove to themselves. You can walk along a footpath during the day to the delightful small port of Fornells. The port has many restaurants and bars looking over the sea and well known for its fish restaurants. You can swim and snorkel from the gardens off the rocks and there is access from the garden by natural steps into the sea or take your barbecue down to the edge of the garden and enjoy an alfresco meal by the sea shore. Bathroom with bath, shower, bidet and automatic washing machine plus tumbler drier. Living room and terrace overlook the sea. Well equipped kitchen - can cater for six people. Withing 5km of the apartment the Son Parc golf course is easily accessable. Club de Golf Son Parc is very welcoming to all visitors. Notes on accommodation: For guests staying for two weeks or longer the room service is provided on a weekly basis and includes a change of towels and bed linen. The price includes cleaning and all other services (electricity, linen, cleaning). A Welcome pack of a bottle of wine and a bottle of water. Cleaning / Towels / Linen / Maid service: All linen and towels provided except beach towels. There is a supplement where there are more than two people. The apartment is cleaned prior to your arrival and again on departure. This apartment is in an excellent location especially if you enjoy swimming and snorkelling, and don't need a beach (although if you need a beach, it's just a short walk away and very nice). With a few adjustments, our stay could have been perfect - for example, better kitchen equipment, ceiling fans or air conditioning, and better communication with the owner. The apartment was advertised as having ceiling fans, however when we arrived in the apartment there were none. This resulted in the apartment being uncomfortably hot, making it impossible to sleep at night. The property is advertised as being cleaned weekly however, we had to wait 9 days before the property was cleaned and the bedding and towels changed after several texts to the owner, this is completely unacceptable. The property is dated and needs some money spent on it, not just with fans but to replace the old and worn out mattresses. The owner is not interested in dealing with the issues at all, once she has the booking and your hard earned cash. Wouldn’t recommend the property. The previous reviewers are absolutely right, this is a wonderfully located apartment, it's so quiet and peaceful, the views are incredible and the sea is literally on the doorstep. There are terraces front and rear so if you want to sit in the sun or prefer the shade you have the choice of both. Rheema was very helpful and concerned that everything was OK for us. We hired a car for 3 days which gave us chance to look around the island and visit some fantastic beaches. In the evening we dined in the restaurants within the "complex" to save driving and were not disappointed with the food. Delighted to hear that you are coming back and that you had a lovely trip - do let us know which dates you'd like! The apartment was as described in the owners direct advert, clean, tidy and well equipped. The area was quiet and well kept with beautiful gardens. The owner had provided details of the surrounding area and places to eat and was more than happy to help via the telephone before the holiday began. There was a lot of literature in the flat to help decide where to go what to see, where to eat etc.. All was extremely helpful. Chris and Liam were on hand should we need them and although we met up there was no need for their services as all was well. Menorca is a beautiful island and this is a perfect base to stay. This was a perfect base for our 2-week family holiday. We loved snorkelling from the garden - it was the best place we found on the island. There is also a shipwreck which is easy to snorkel to just around the corner. We also spent lots of time sitting on the balcony watching the sunset, or the sea, or the boats passing up and down. Playas de Fornells is a great place: just big enough to have everything you need but not too noisy. The apartment is very comfortable and had everything we needed. Chris and Liam look after the apartment very well. Lovely apartment, well equipped, an ideal base for our hobby of birdwatching. The views are spectacular. Local restaurants are first class and were frequently used. Liam and Chris (who look after the property) were most helpful, both before arriving and during our visit. We did a lot of touring and saw a lot of the island, we are sure to return in the future, and will hope to use this apartment again. I am so pleased that you wenjoyed your holiday in Menorca and enjoyed staying in our holiday home. The position Is. Great and the island is perfect if you enjoy bird watching . On the opposite side of the bay opposite our island is the nesting area for some rare birds .. We could see them flying from our .terrace. It is an island where lots of migrating birds stop and we have seen flamingos on one occasion! is also great for the people who want to find a small secluded cove to themselves to swim and snorkell in the summer. Only 2 hours from London so easy to get there it is a very unique place. Best wIshes we look forward to seeing you again! 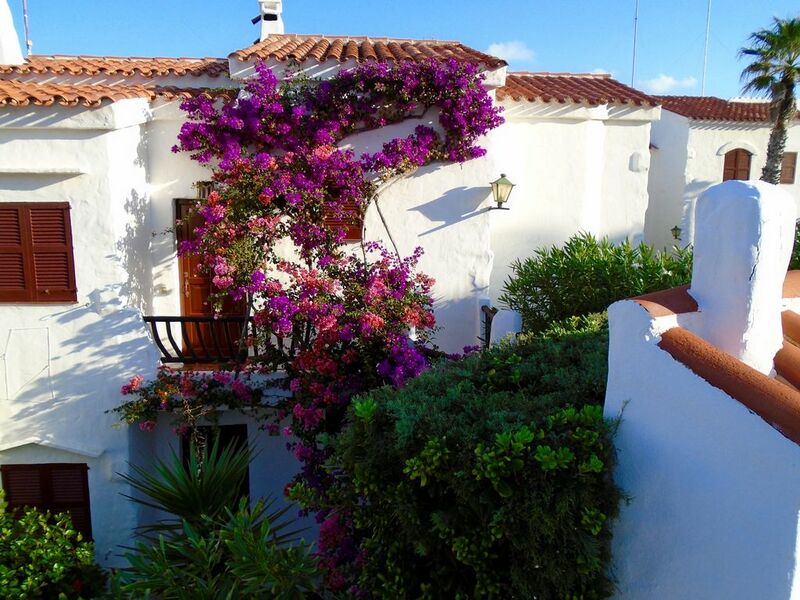 The apartment is located close to the fishing village of Fornells, ideally suited to holiday for relaxing, swimming, eating, walking and generally soaking up the local atmosphere. Mahon, the capital, has a beautiful deep water port and its graceful architecture was much influenced by the British occupation. Ciudadela, the old capital, is a fascinating old town with narrow winding streets, beautiful Moorish architecture and a delightful port with many small restaurants. There are a number of restaurants in Playas de Fornells. Several are in the row by Es Cactus. I can recommend Restaurante du Nord & Es Cactus. I hear the restaurant opposite Tramontana 2 has new owners and I have heard it is good but I have not tried it yet. It has an enviable position. Booking Notes: Please refer to website or contact owner for details. Bookings should be Friday to Friday - if not, a supplement of £90 will be charged for extra cleaning. Changeover Day: The apartment will be ready for occupation by 1pm on the day of arrival. The apartment must be vacated by 10am on the day of departure.